Steven (Chicagoland, United States) on 30 September 2010 in Architecture and Portfolio. 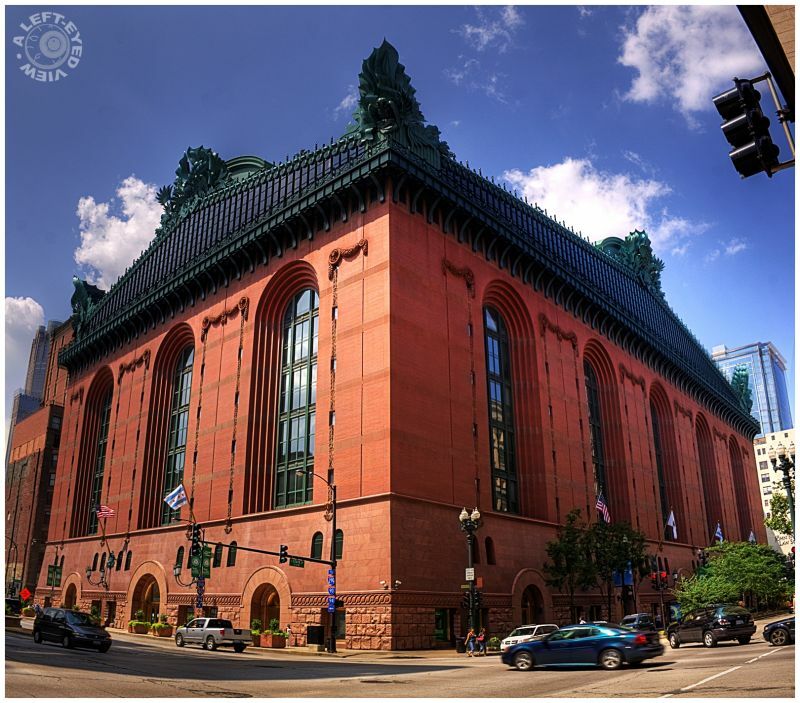 Located at 400 S. State Street, the Harold Washington Library Center is the central library for the Chicago Public Library System. The bottom portion is made of large granite blocks. Red brick makes up the majority of the exterior. These two portions draw on the Beaux-Art style. With the support of then Mayor Harold Washington and Chicago's wealthy Pritzker family, ground was broken at the chosen site at Congress Parkway and State Street, covering an entire block. Upon the building's completion in 1991, the new Mayor Richard M. Daley named the building in honor of the now-deceased Washington, an advocate of reading and education among Chicagoans as well as an advocate of the library's construction. Since completion, the library has appeared in the Guinness Book of Records as the largest public library building (not library system) in the world. Photo captured August 6, 2010. You would have thought the building was finished at the turn of the century... 1900's that is, not twenty years ago. I do like the roof too, what's it made of? Like the lovely earthy colour.. a fine architecture.. love the big windows.. I sure like the roofline and the art up there - wow. The entire building is phenomenal! Chicage is such a cool city. Great job Steven!! Great photo . Great light and colors . Love the pov, lighting, colours and the details on the roof..
Bonjour Steven. Superb photo. Your framing is excellent and colours are very beautiful. The blue sky with the clunds are very wonderful. Excellent work Steven. Have a great day Steven. very interesting and beautiful shot of this beautiful structure! Great color and clarity! Stunning!!! An impressive and stately building in that red and black (or dark green) garb. An excellent wide angle shot. Some might see this a a rather ungainly building but, oh, what a sizzling way to turn a corner ! I'm always fascinated by these giant American libraries! Fabulous!